Welcome to your château – a free-floating form with a striking interplay of concrete & crystals, contemporary design homes in Bangalore. An unembellished yet imposing concrete forms the core of Stratos. 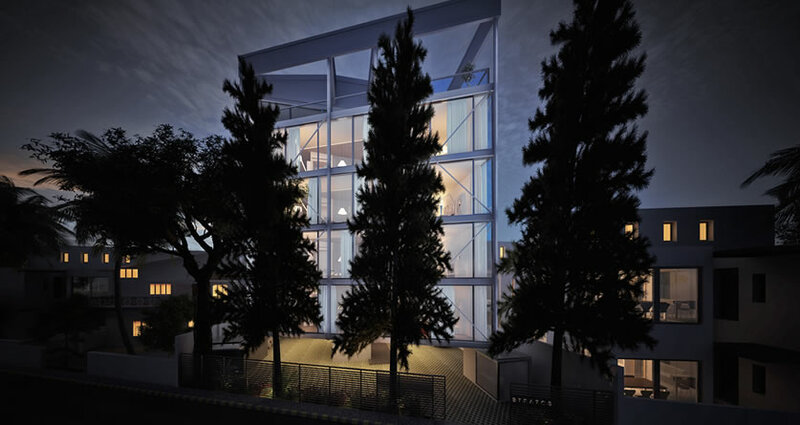 3 BHK luxury apartments in Cunningham road. 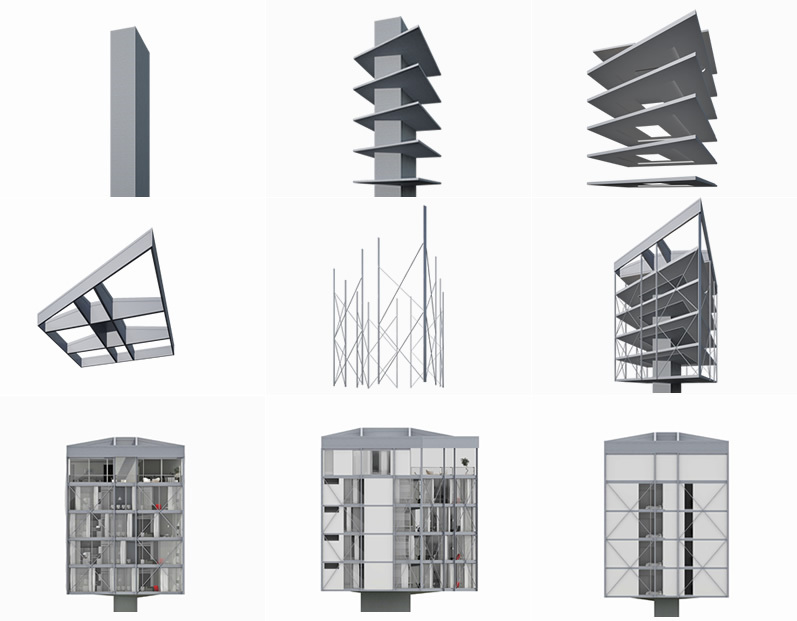 While it is commonly believed that it takes more than just one pillar to support a building, our best-in-class technology has proved the age-old belief wrong! With our expertise and experience in creating and constructing world-class spaces, we have developed an unembellished yet imposing concrete structure. This structure is the "pillar of strength" that not only forms the core of Stratos but also transcends the boundaries of science, technology and creativity. The Stratos floor plates are suspended from beams that extend from the top of the pillar. The cantilevered construction lifts the building off the ground, freeing up space at the ground level and giving Stratos its distinctive floating form. The pillar and its geometric capital accentuate the contemporary minimal aesthetic of each condominium. There are only a few people who could make use of concrete the way Canadian born Architect Dominic Dube does. The Bengaluru based extraordinary architect has worked in countries all over the world, including Mexico, Thailand, Greece, USA and France. DDIR was founded in 2003 by him and Inge Rieck. The vision of the studio is based on the integration of architecture and design with art (nature), technology (structure), life (light) and culture (spirit). A firm believer of minimalism, sophistication and elegance, Dube, has done Bachelor of Architecture in 1980 from Montreal, received his training in Canada and Italy and has been practicing architecture professionally for over 25 years. For the past sixteen years he has been working in India and has been involved with projects of all scales, from intimate interior spaces to large town- and urban-planning schemes. Dube’s work portrays neat lines, details which are well woven into the main design without overpowering the design. His biggest strength as an architect lies in ‘proportions and equilibrium”. His firm DDIR has garnered several accolades too. It won the first international price for a low Cost Housing Development in Mexico. Other noteworthy awards include a second prize for the museum of modern art in Montreal; trophy for excellence in design, and a few more awards for residences. Dube’s work has received a lot of publications in Indian as well as international journals. His work as he says is, “Directly connected with the close environment together with the communion with the world”. Subtracting unnecessary walls, the lobby-living-dining-kitchen is a free flowing open plan design. Besides making room for more, it gives the living or public area within the condominium a deck-like feel, with its transparent facade making the trees as much a part of the interiors as the exteriors. 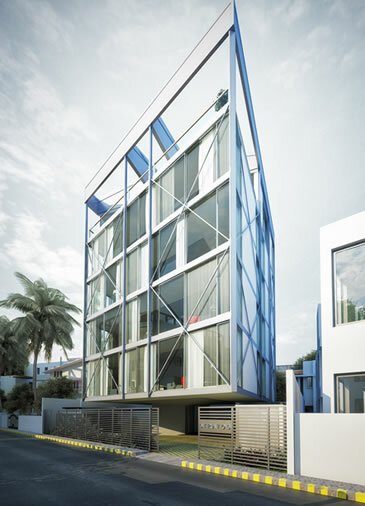 Condominiums for the discerning, these centrally air conditioned and fully automated homes offer the best in the world. With a complete floor for each condo and an open plan living area, the 2327 square feet three bedroom residences project a sense of space beyond their measure. 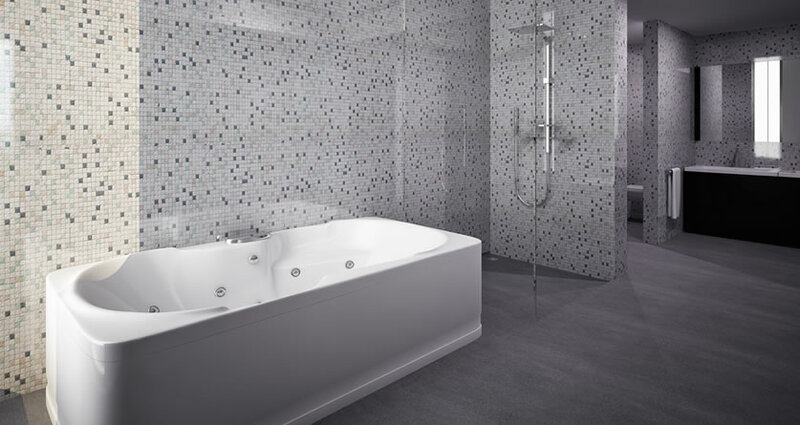 Intimate personal spaces with top-of-the-line en suite showers. A contiguous lobby-living-dining-kitchen plan punctuated by airy passages, the central pillar and fluid partitions. An integral part of the living area, the open kitchen is a space for food and family. State-of-the-art modular designs have been selected from leading brands to bring home the joy of cooking. High-end sanitary ware, Italian marble flooring and shower stalls. Separate area for domestic utilities equipped with electrical points for appliances. High quality biometric locks and video intercom. 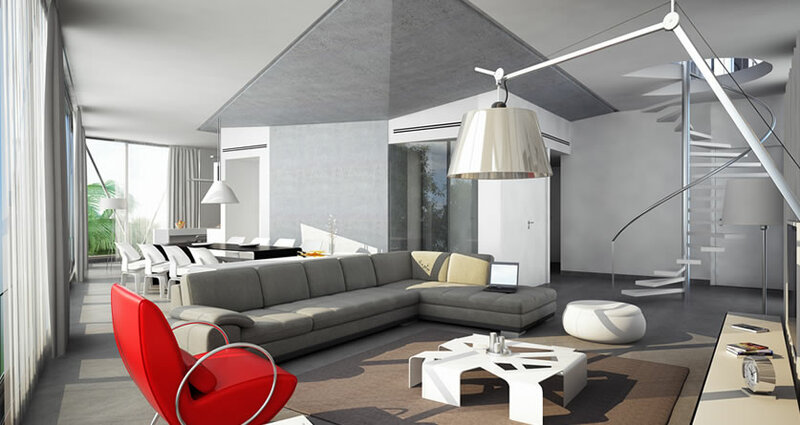 The pièce de résistance, crowning the highest realm of Stratos is the 4654 square feet penthouse. 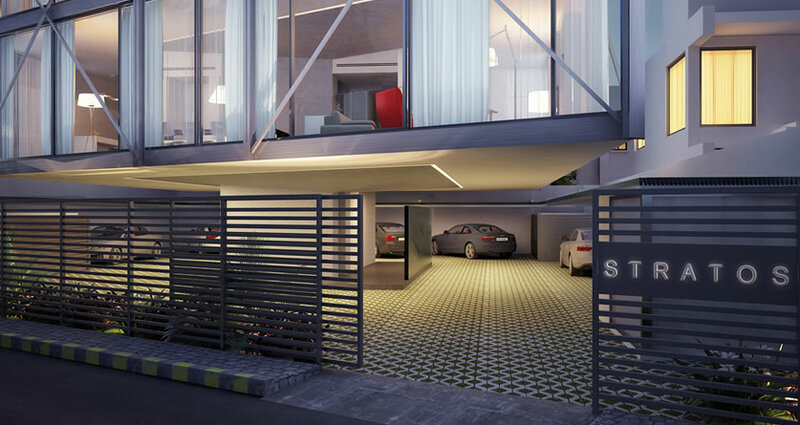 Sprawling across two floors, it is the ultimate in luxury living. Above the typical Stratos condominium lies the master suite complete with a fourth bedroom and a customizable space that can be used as a gym, studio or a private den opening out to a 752 square feet terrace. With 3 bedrooms on level 1 and the master suite on level 2. The unobstructed interaction between the living, dining and kitchen areas offers a heightened sense of space and togetherness. Spanning 1575 square feet, the master suite is everything you want it to be – a luxurious bedroom with a space that can accommodate a gym or studio. Add a Jacuzzi or a bar, the choice is yours. Because in the heart of Bangalore, one must enjoy the best of its weather. The service area of Stratos is designed in tune with its overall spatial and aesthetic concept — whether it’s a car park or the security room. We recognize that every part of a space you call home shouldn’t just be accessible but also welcoming. Luxury apartments for sale in Cunningham road, Bangalore. For 2 cars per condo amidst manicured lawns with illuminated awning. 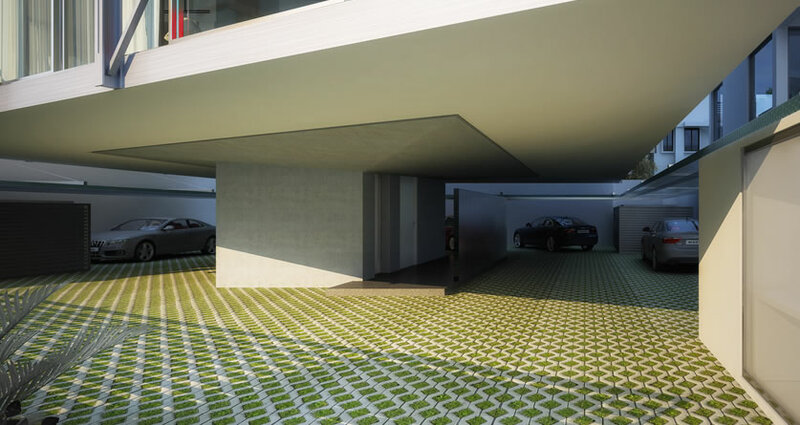 Basement car wash and charging points for green cars. Smart home automation, CCTV surveillance and video door phones to allow only those who are welcome. Reliable backup power to outlast any outage. 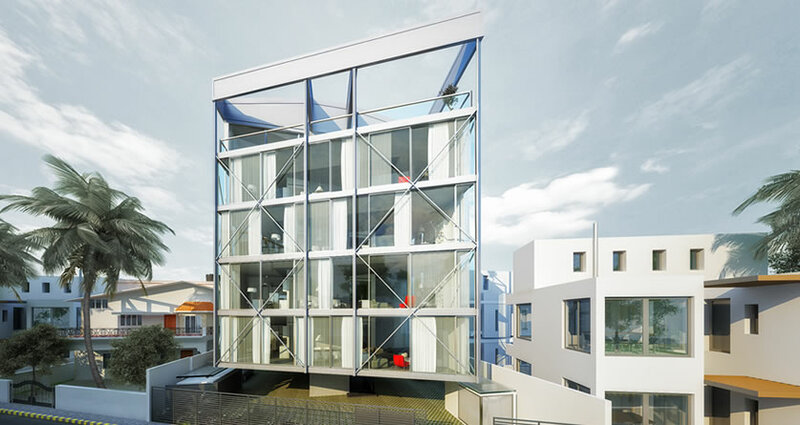 The facade is an alternating rhythm of floor plates and clear glass. Natural light pours in with the extensive use of glass, allowing an enhanced perception of space and a close dialogue with lush trees that flank the property. While glass walls blur the line between the inside and the outside, multiple layers of screens afford privacy and keep sun and sound in or out, as the situation demands. 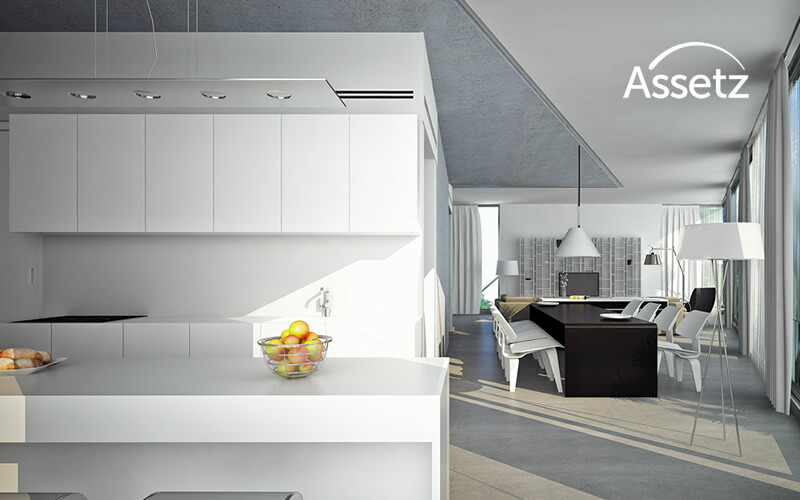 An Assetz Homes residence epitomizes the platinum standard – precious, top notch, stylish, exclusive, and rare. Flip through the pictures of the luxurious and premium residences meant for those who want to experience an exclusive lifestyle.